Website and processes: 7 Dec 16 Bill, 5/5 Excellent "Plenty of choice and good level of information offered. Easy payment process and delivery." Majestic, silent, awesome are all words to describe the beauty and fun experienced with a flight in a glider. 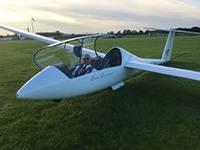 This Gliding course will provide the student with the opportunity to get to grips with gliding and the instructor is also on hand to answer any questions that you wish! Event takes place at Banbury West in Oxfordshire . The voucher will have Banbury West printed on it, but it can be used from..